1. 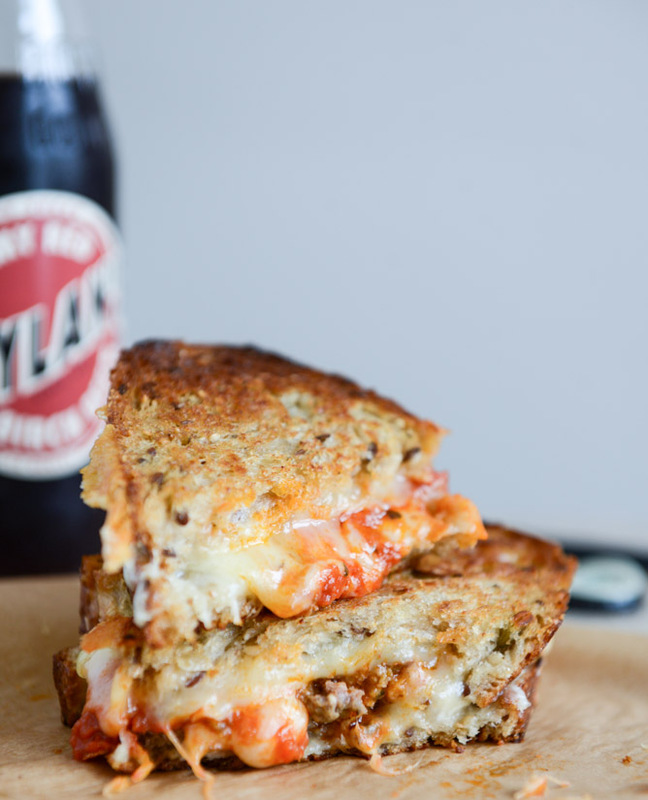 Melt 2 tbsp. butter with olive oil in a large heavy skillet over medium heat. Working in batches, add sausages, and brown on all sides, about 10 minutes total. Transfer sausages to a plate, cover with aluminum foil to keep warm, and set aside. 2. Melt remaining 2 tbsp. butter in the same skillet, then add carrots, leeks, and apples, stirring to coat vegetables and apples with butter. Season to taste with salt and pepper, and cook until everything in the pan is glazed and slightly browned, about 10 minutes. Pick apple wedges out of skillet and set aside. 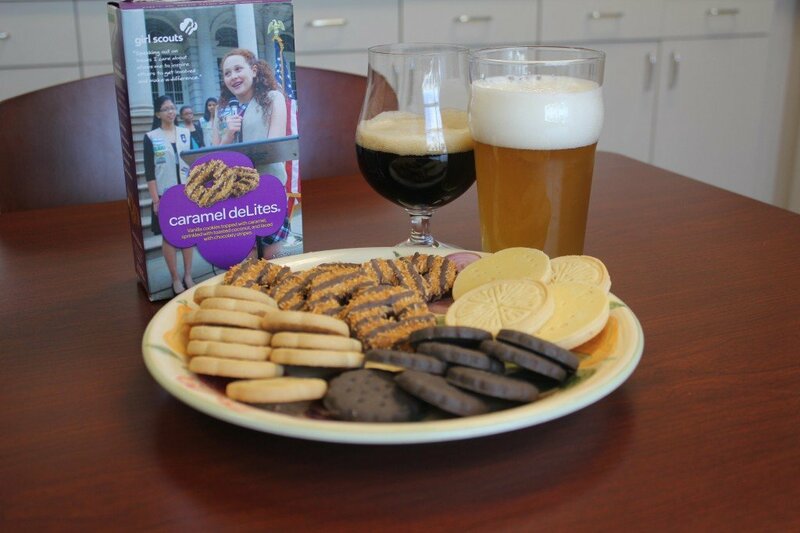 Add beer and demi-glace (if using), and, with a wooden spoon, loosen any brown bits stuck to the bottom of the skillet. Reduce heat to medium-low, then cover and cook for 20 minutes. 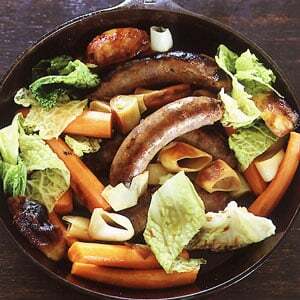 Return sausages and apples to the skillet, then add cabbage. Cover and cook until vegetables are tender, about 20 minutes. This fish chowder features a rich tomato broth, hearty potatoes, smoky chorizo, and savory fish that is not only fast, but is sure to be a hit at your table! In a large pot, brown the chorizo over medium-high heat, 1 to 2 minutes. Add the leeks and cook, stirring occasionally, until beginning to soften, 3 to 4 minutes. Add the potatoes, tomatoes (with their juices), 3 cups water, ¾ teaspoon salt, and ¼ teaspoon pepper. Cover and bring to a boil. Reduce heat and simmer until the potatoes are just tender, 10 to 12 minutes. Add the fish and simmer gently until opaque throughout, 5 to 6 minutes. Stir in the parsley before serving. *Editor’s Note: Spanish chorizo is smoked pork sausage that’s loaded with seasonings like garlic and chili powder. If you can’t find it in your supermarket, use bacon instead. In a large enameled cast-iron casserole or Dutch oven, cook the bacon strips over moderately low heat, stirring occasionally, until lightly browned, about 8 minutes. Add the onion and cook over moderate heat, stirring, until very lightly browned, about 5 minutes. Stir in the bell peppers and garlic and cook, stirring occasionally, until softened and lightly browned, about 5 minutes longer. Stir in the sausage slices, crushed red pepper and paprika and cook for 2 minutes. Add the tomatoes and cook until beginning to break down, about 5 minutes. Add the beer and bay leaf and bring to a boil. Cover partially and cook over low heat until the vegetables are very tender and the sauce is slightly reduced, about 15 minutes. Season the stew with salt and pepper and serve with grilled bread. 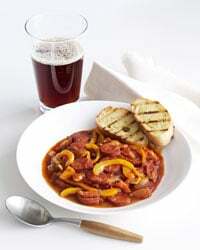 MAKE AHEAD The stew can be refrigerated for up to 3 days; gently reheat before serving.